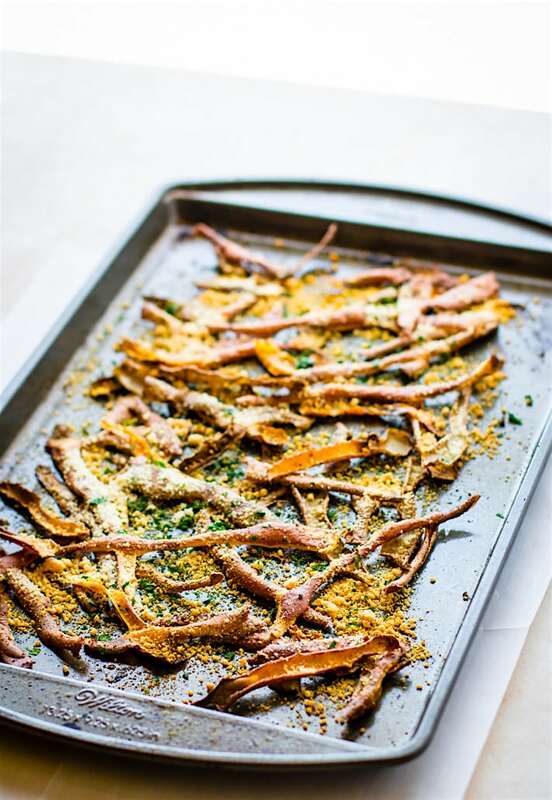 Healthy Oven Baked Parmesan Sweet Potato Skin Fries! 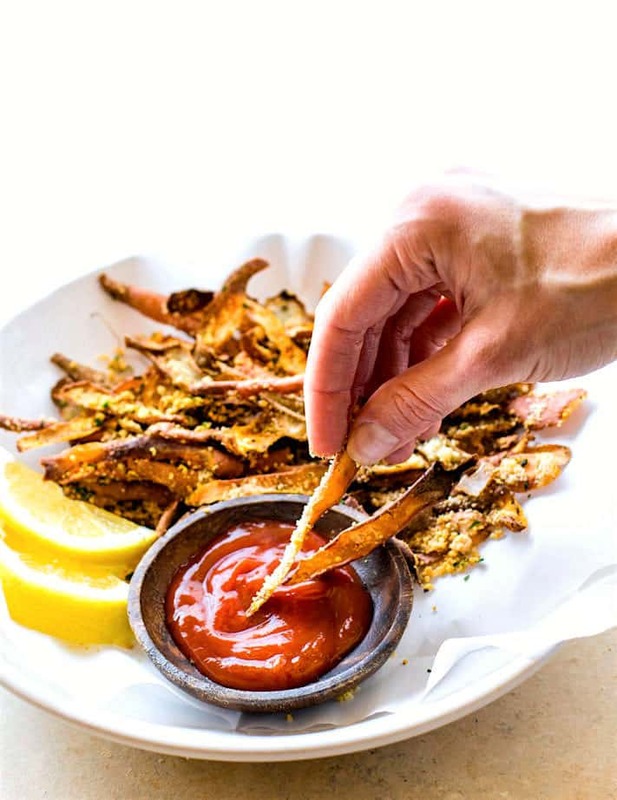 Super simple oven baked sweet potato skin fries made from leftover potato skin peels. 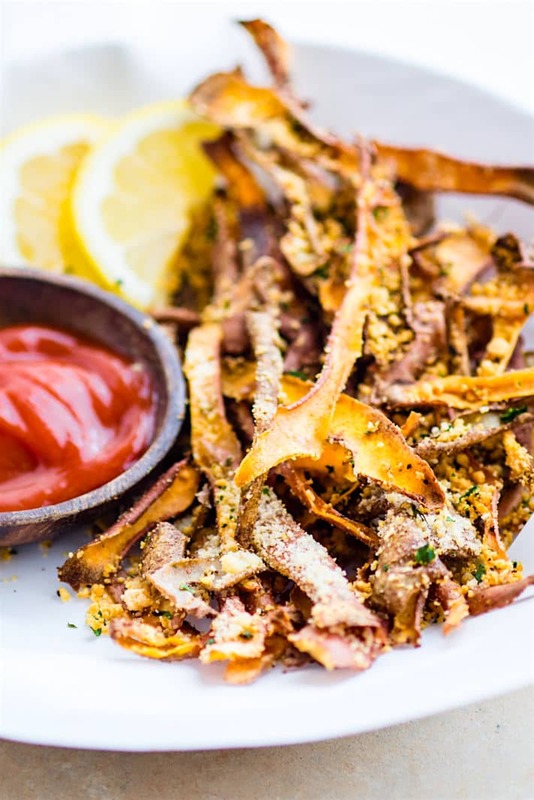 So crispy, easy to make, and paleo friendly. Great snack or side dish that everyone loves! Hey hey! You ready for the Holiday weekend? Ya’ll, it’s so close to Summer! I kinda feel like Memorial Day weekend sets the tone, yes? Speaking of Memorial Day, I know many will be grilling and making all kinds of delicious goodness. Ahem… like BBQ! BBQ Chips/fries, grilled veggies, Burgers, Cookies, etc! But I have one request for when you start preparing your holiday food. 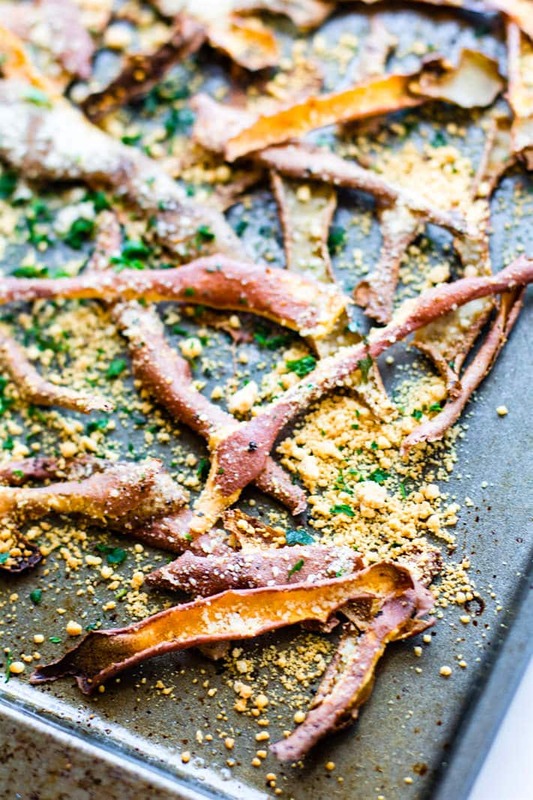 Whatever you do, don’t throw out your potato skin shavings. Regular or Sweet potato Just don’t. WHY? 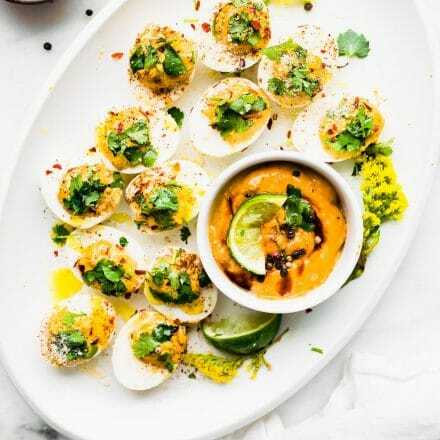 Because I have an AMAZING way for you to repurpose those potato skins and make them into AN EPIC dish. You ready? 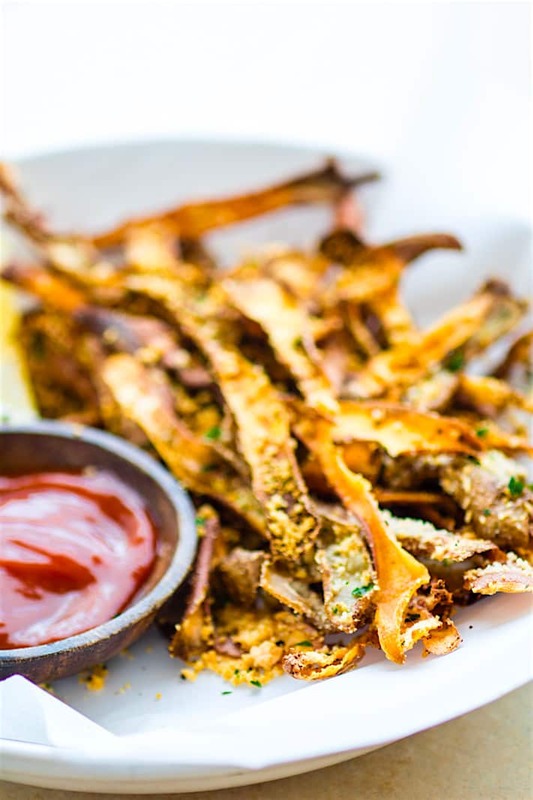 Sweet Potato Skin Shavings make a delicious batch of crispy crunchy potato skin fries! As you all know, I HATE wasting food and leftovers. Like all parts of it. Which why I make rice waffles or turn gluten free bread crusts into casseroles. Yep, my mother ENGRAVED the resourceful gene in me. A trait my husband truly appreciates. Well, at least I hope he does. haha. Anyways, back to my potato skin fries. 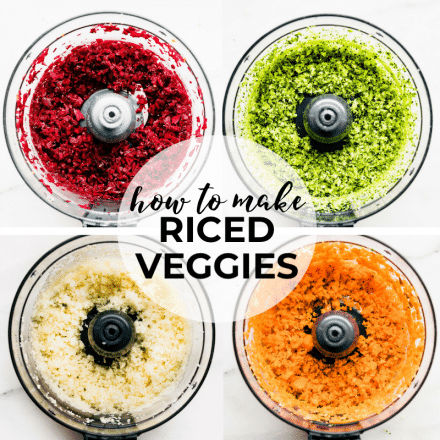 So.. this recipe came about when I started spirlalizing vegetables more. Sometimes I would leave the skin on before spiralizing but the majority of the time I shave off the skin from potatoes, sweet potatoes, and cucumber. And sadly, all that veggie skin goodness just went in the compost. Which is still better than the trash, but still… I like potato skins! I started to notice that some of the larger potatoes made bigger potato skin shavings. And that’s when it hit. Um…. I could so BAKE these and use them as fries. HELLO —> LIGHT BULB in head moment! I feel smarter and very homemakerish for my idea. It had to be done! Peeled, oiled, seasoned, added some parmesan crumbles, and baked. VOILA! Sweet Potato Skin Fries Success! If you’ve done this before, don’t tell me. I want to feel original. haha, although I’m sure I’m not. But you know what else is cool? You can use other root vegetable skin shavings and just adjust the time. I tried carrots, parsnips, and regular potato. The carrots definitely cook faster but totally work! My suggestion would be to save up your skins for one big bake. You can keep them in a ziplock bag in the fridge until your ready to bake them. One little potato won’t get you many fries, but if you are making mashed potatoes or any other spiralized or regular potato salad for a potluck, then you can definitely get more fries at once. If that makes sense? Okay you ready to shake and bake? LOL! Just go with me here. Optional basil or red pepper topping. Preheat oven to 400F. Grease a baking tray or line with parchment paper. set aside. Clean your potatoes and peel each making thicker peels. About 1/2 in or more wide works best. Place in bowl. Add in your oil and spices and toss the skins. Lay flat and even on baking tray. Add more spices here if desired. Remove from oven and add evenly parmesan crumbles on top. Place back in oven and bake for 6-7 more minutes or until crispy. Remove and add optional dried basil or red pepper before serving. Store in ziplock bag after cooled if you aren’t eating right away. If you are using carrot or parsnip peels, then you will need to adjust the cooking time. They will usually cook faster. I should also note that I have NO idea how many calories are in these potato skin fries, but at the same time, I don’t think it matters. It’s a vegetables. It’s REAL food. And it’s probably the ONLY baked fries recipe that you can over eat and not feel guilty about. That being said. Let’s get our snack attack on! What are you holiday plans? Do they involve massive about of BBQ potatoes? Ohhh but they should! haha! 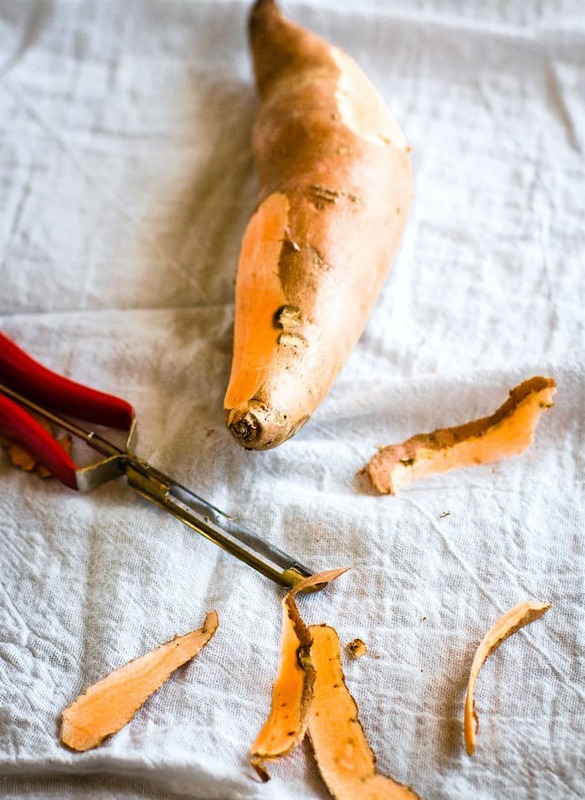 Ever made something from a root vegetable peel? Do tell! I usually just eat the skins after baking (attached to the flesh or not!) but this is genius. And I will be spiralizing later tonight, so maybe I’ll peel them first! Not to mention potato skins have a wealth of nutrients in them. Love this! No plans this weekend other than school and work. I have sponsored travel next week so it’s going to be busy getting work done! I’m cracking up over the amount of calories…so true…does not matter! I mean, truly, these are perfection! Such a great way to use those skins that I’ve been throwing into the compost pile! It’s so hard to create a great crunch with sweet potatoes, so this really solves that problem too. Love this, Lindsay…can’t wait to make them. using the peel is such a great idea! i LOVE sweet potato fries!! Okay Lindsay, we are technically in the same city so, room service? Lol! I want this! 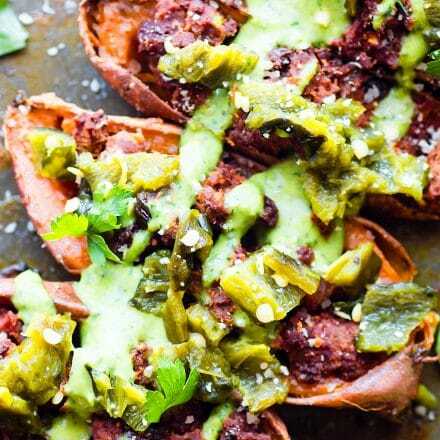 Oh my goodness, these sweet potato skins are TOTALLY genius! Never again am I throwing out the potato peelings!! Calories definitely don’t matter here! They look delicious and SO crispy! Have a great weekend, Lindsay! Well, I know what I’m making this weekend, YUM! These sound so good! I usually just slice mine into circles and eat the whole thing or make it in the microwave when I’m lazy (99% of the time). I bet these are delicious! How incredibly resourceful!!! Love this idea, Lindsay. 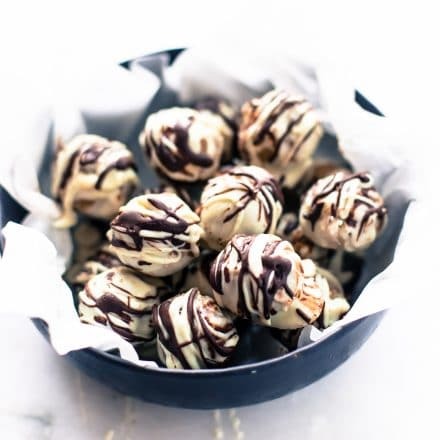 Making these soon for sure. totally! let me know if they try it! I love the peel! Plus, who couldn’t use more fiber? I really love that you did this with sweet potatoes. I still won’t go near “regular” ‘taters. Blech. haha fiber us up! then wine to digest. yes? Waste not want not never looked this good before! 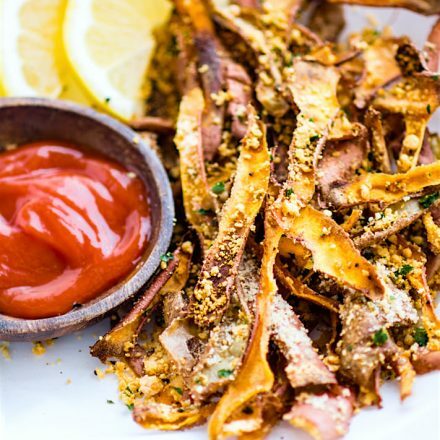 We usually leave the peel on homemade baked fries already but just the peel sounds like an even crispier = better idea. Helloooo crisp, crunchy deliciousness! These look PERFECT! I love the skins and this idea is so creative! I’ll definitely use this next time I spiralize ? I AM A SKIN PERSON!!! genius!!!!!!!!!!!!!!!! I can’t remember the last time I peeled potatoes – I prefer them with the skins on, plus I’m a lazy cook – but I would peel some potatoes for these! yea! well let me know if you try it Hannah! I actually LOVE LOVE LOVE sweet potato skins! They’re one of my favorite parts of the sweet potato! 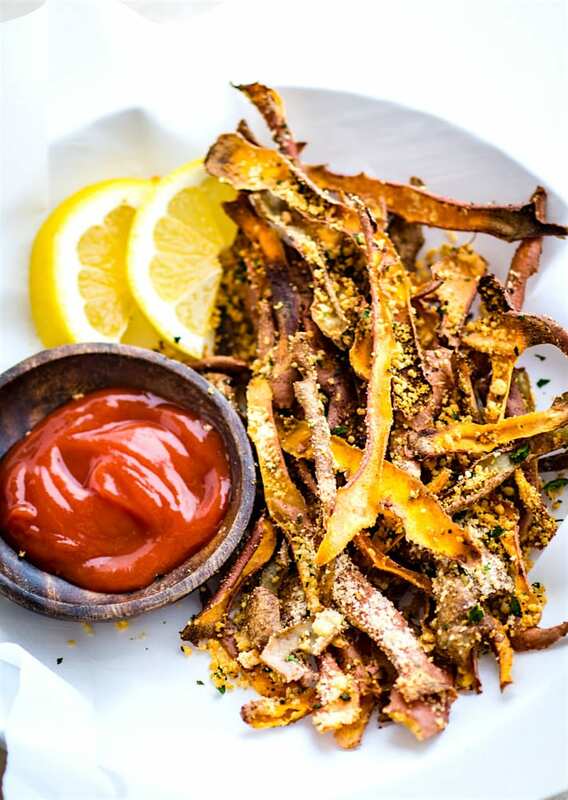 If you haven’t tried it already, you have to try kabocha skins. They are so tasty, filling and versatile! I bet you can cook them the same way! i love all squash skins! haha YES! Sweet potato skin fries! What is this madness or should I say genius. Be still my potato loving heart. I am in awe of your waste saving skills. I bow before you. it’s engraved in me. In case I get stranded somewhere, right? LOL! kidding. Hopefully. Your blog can be an inspiration! Aside of useful tips really, it’s just really! This website post is completely educational about academical range we must take care of all of this basic things of cooking.